Pasta Aglio e Olio - Eat. Drink. Love. I know what some of you are thinking, “What the heck is Pasta Aglio e Olio?!”. Pasta Aglio e Olio is a traditional Italian dish that means pasta with garlic and olive oil (two of an Italian’s favorite things!). My Grandma taught me this recipe many years ago. On its own, it can be kind of plain, so I typically make it as a side dish with chicken or fish. I like this pasta dish because it is simple and not too heavy. To give it extra flavor, I sometimes add lemon juice and/or a splash of white wine! 1. Bring about 4-5 quarts of water to a boil. Add in 1 tbs. of salt. Add pasta. Cook until tender (approximately 10-15 minutes) and drain pasta. 2. Heat non-stick pan to medium heat. Add butter, olive oil, garlic, and lemon juice (and wine, if using it) and simmer. Gradually add in pasta, making sure to coat all of it in the sauce. Add salt and pepper to taste. 3. Remove pasta from pan into a serving bowl. Toss parsley and Parmesan cheese into pasta. If I used the white wine in the recipe, when would I add it? Lisa – I would add it at the same time you add the lemon juice! I’ve actually made this before, and it is very yummy! Isn’t it though?! And so easy to make! 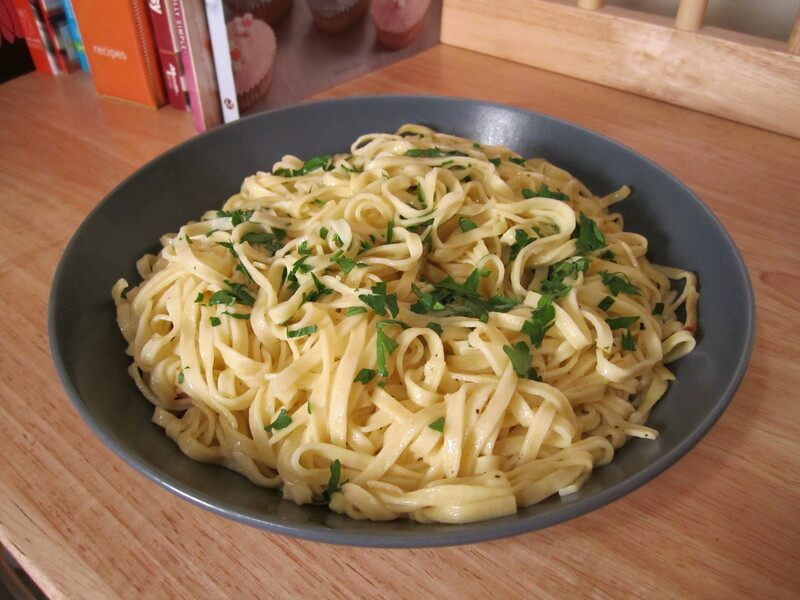 Pingback: Flashback Friday: Pasta Aglio e Olio - Eat. Drink. Love.